Just along the Esplanade from Woolacombe village stands Hartland House, most regular visitors to Woolacombe will recognise this landmark building in a prime location opposite the main 3 mile sandy beach. Each apartment has one marked parking space and the great outdoor space with sunloungers and table and chairs is shared. Oceanview is a stunning 3 bedroom, 3 bathroom 1st floor apartment with the most superb seaviews which makes an extremely special place to stay when holidaying in Woolacombe. Certainly all is considered and catered for internally. A small inner hallway and corridor give access to all rooms which lead off it. It is on one level once inside the first floor apartment. As you enter the living area you are immediately struck by the view and it takes your breath away, so close to the beach you can hear the waves roll over the sandy shoreline, just magical! This delightful open plan kitchen, diner, living room has a fully fitted kitchen at the rear, sofa seating in the middle and table and chairs at the huge window to fully take in that view. 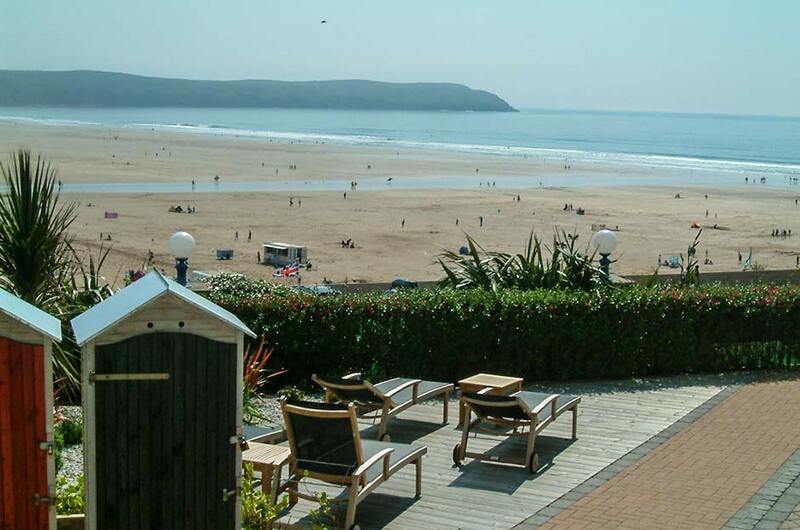 There is a fabulous double master bedroom with king size bed looking out to the front with amazing views across Woolacombe Beach to the sea and sands of this iconic bay, literally paces away! It has full en-suite facilities. The other double bedroom at the rear of the apartment also has a full en-suite shower room. Along the corridor towards the living room is the gorgeous bunk bed room , also at the front with views and delightful nautical themed bed line and touches. This bedroom enjoys exclusive use of the family bathroom with shower over bath. Outside there is parking for one car and delightful communal decking and patio areas to the side of the building where beach chairs and body boards are provided in a private lock up shed where wetsuits and a short boards can also be stored. Wooden loungers and outdoor dining table and chairs make this sunny area ideal for spending the day when you are not wanting to be on the beach. The views are outstanding from here.